Credo is very SEO-focused for the clients we bring in who are looking to hire. In fact, over 70% are looking for a project that has an SEO component (technical, content, outreach) involved. 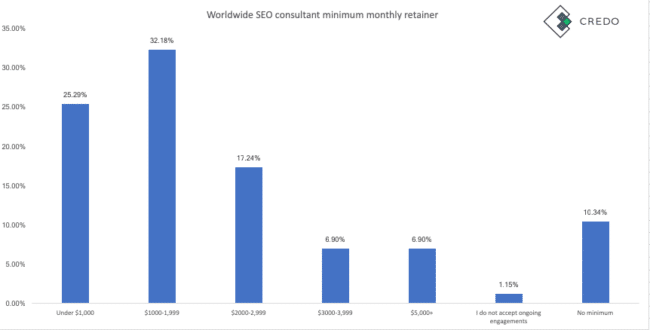 There are many studies out there that show “SEO consultant rates” or “SEO agency rates”, and while those may have more respondents than ours they are also more global-focused and less focused on the specific countries that Credo serves. So, this section is mostly about US and UK based SEO agencies and consultants, though we also give you a view into our view on the global SEO market and its rates. 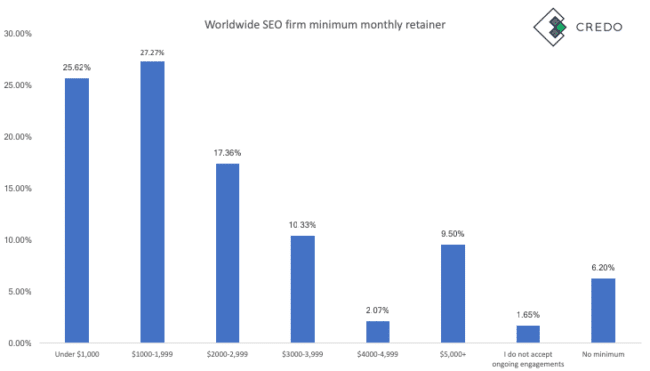 First, let’s look at the SEO firm average rates worldwide. 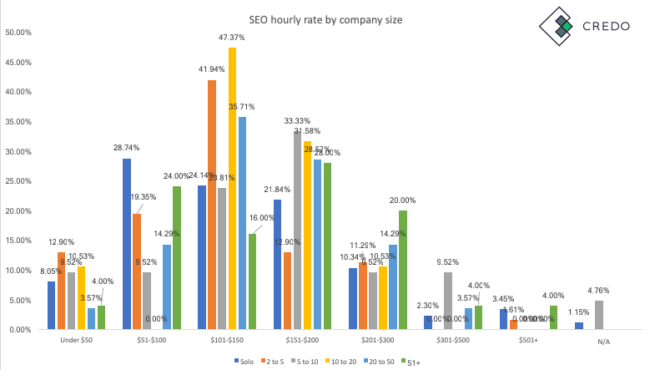 Worldwide, SEO firms charge on average $149 per hour. 8.68% of our respondents charge under $50 per hour and ~29% charge under $100 per hour. Now let’s look at some deeper cuts to see how the numbers change. Link building is a common activity in SEO and is absolutely important for ranking sites. We were interested in whether firms that build links charge more or less than firms that do not. A higher percentage of link building firms charge $101-$200 per hour than non link building firms. 4x more non-links firms charge $501+ per hour than links firms. Overall, this data surprises me a little bit, though then I remember that this is worldwide and the data skews lower than I usually think it will. The figures I expected are that a higher percentage of links-offering firms bill between $101-$200 than non-links firms and that non-links firms charge more as a percentage in the higher hourly rates. 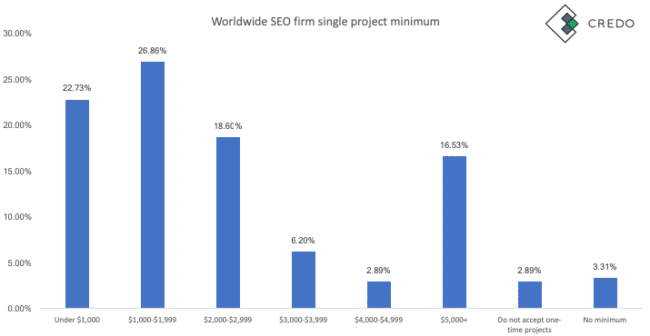 We are extremely heartened to see that 16.53% of the SEO firm respondents do not take minimum projects for less than $5,000! 49.59% (almost half) of the respondents report doing single projects for less than $2,000. 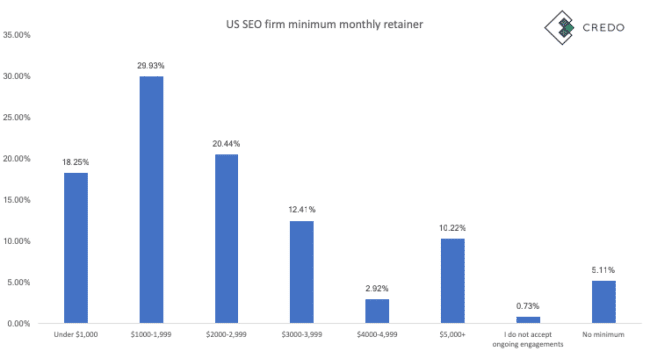 Now that we’ve established the worldwide SEO agency/firm rates, let’s look at the US numbers. ~8% charge less than $100 per hour. 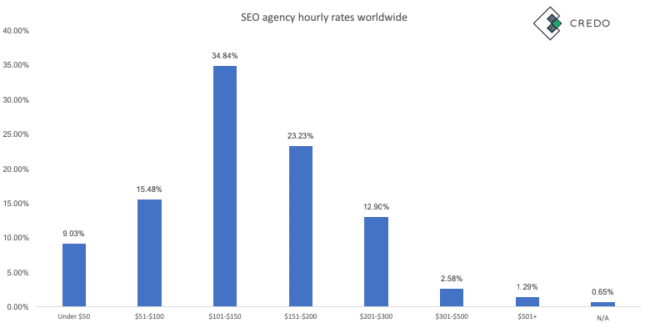 Now let’s look at UK SEO agency hourly rates numbers. 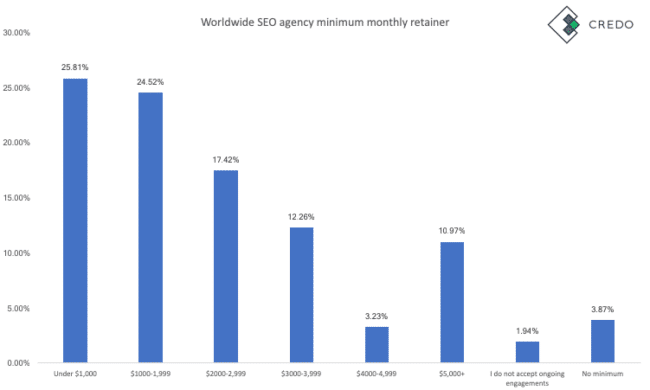 We had significantly fewer UK agencies who do SEO respond than US (90 for US, 24 for UK) so these numbers are not as strong as US, but they’re still directionally helpful. 41% still charge $101-$200 per hour though, the same as the US. I suspect this is skewed by fewer respondents in the UK, but is interesting nonetheless. Zero UK SEO agencies in our dataset charge $301 or more per hour. 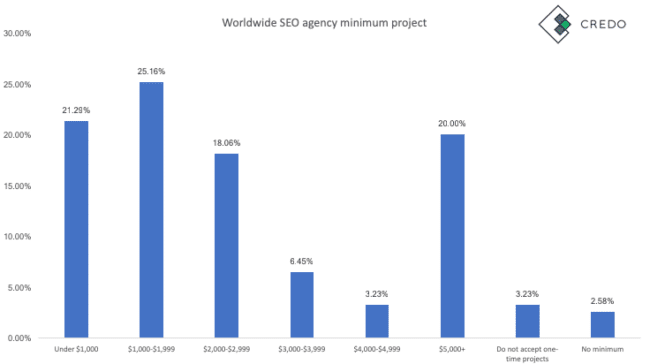 Now let’s look at the average SEO agency (2+ people) rates both worldwide and for the United States. 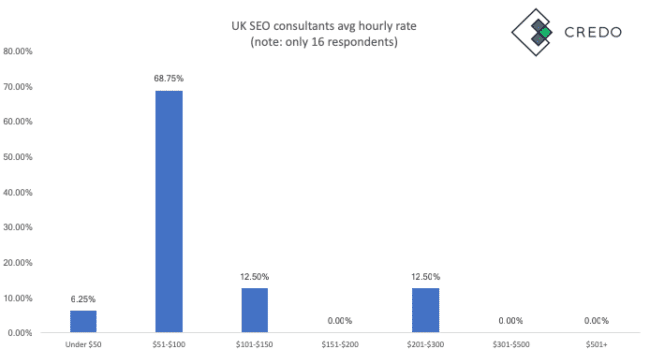 Before digging into the average SEO consultant rates in US and UK, let’s look at them worldwide. 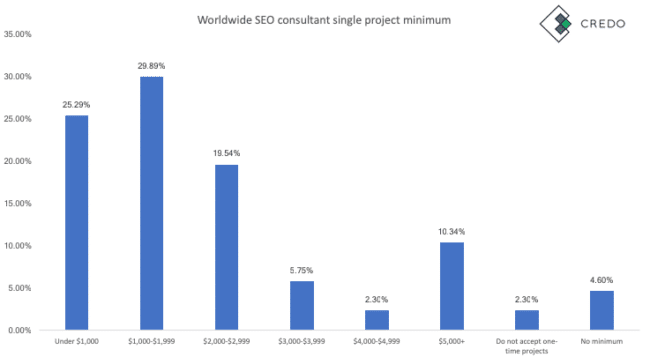 Only 5.75% of SEO consultants who responded to our survey charge over $300 per hour. 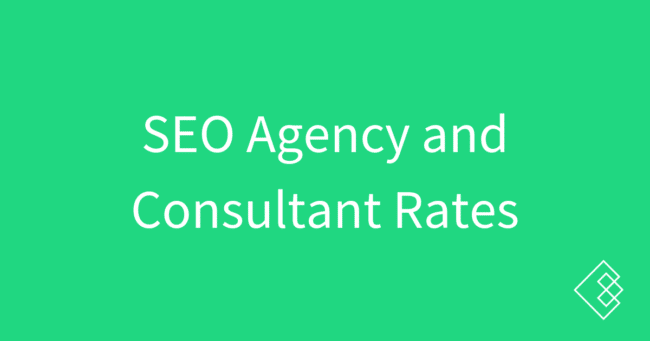 Now let’s look at US SEO consultant (only 1 person in the company) rates. We had 47 such respondents. 25.53% charge less than $100 per hour! 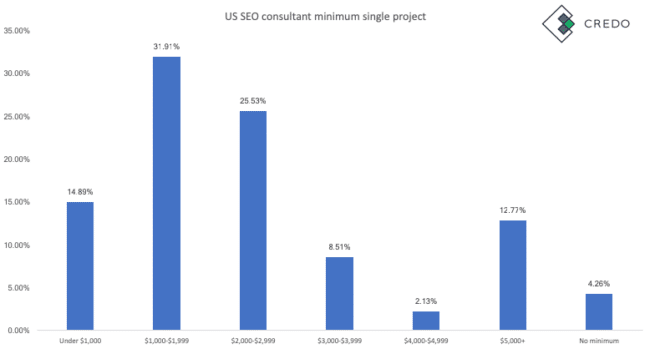 6.38% of our US SEO consultant respondents charge $500+. This is 3 of the 47 who replied. Similarly to the SEO agencies, we had dramatically fewer UK respondents than US respondents. We had 47 respondents in the US versus just 16 in the UK. Because we do not have enough data here, we will not call out interesting pullouts.